We’ve got you covered with preparedness tips and safety highlights. You are a seasoned rider, but what about the rest of your group? If you have new or youthful riders in your party, a snowmobile safety course might be a perfect way to introduce them to the variety of handling decisions, trail etiquette and handful of hazards associated with the sport. Best of all, some insurance carriers offer discounted rates for individuals who have successfully completed a safety course. The most weathered riders understand the dangers associated with improper handing and usage of snowmobiles, including hidden obstacles, icy conditions and excessive speed. Ensure safety while riding by reviewing this safety checklist and keeping these in mind. Snowy days may be part of the experience of snowmobiling, but it’s still essential to know the forecast before getting underway. Knowing what conditions to expect can help you select the appropriate gear for the day, as well as alert you closed trails, frozen terrain, crippling wind chills, or expected white out conditions. If unfavorable conditions arise, it’s wise to plan your ride for another day. Always allow your sled to warm up before riding. A 10-minute period is typically enough. In addition, before you ride, check fuel and oil levels, battery, brakes, drive belt, skis, throttle, handlebars, headlights and taillights. We all know that there is safety in numbers. Set out with a companion whenever possible, and avoid heading out on your own unless the need is critical. If you must ride solo, inform others of your plan and anticipated location. Sticking to marked trails minimizes the incidence of unexpected hazards and obstacles, as public trails are typically groomed and maintained for riders. In addition, marked trails have been approved for use, and do not crossover onto private property, or restricted areas. Most rides are fun and uneventful, but you never know what’s going to happen out on the trails. Be sure to have a fully stocked first-aid kit with you for every ride. Some important items to keep in there include bandages, pain relievers, scissors, medical grade gloves and antiseptic. Right next to your first-aid bag should be a stash of emergency supplies, including maps and/or compass, flares, space blankets and extra food and fuel. Of course, the most important preparation begins with your protective gear. Never set-out on the trails with helmet and gloves. Reflective clothing is never a bad idea either. If you are looking for snowmobiling communities to engage with, or the latest updates on trail conditions, snowtracks.com is a popular site designed to connect, inform and protect riders of all ages and experience levels. We know that snowmobiles are not only dangerous, but expensive. So, we pride ourselves in offering coverage through select carriers covering many of the risks involved with owning and riding a snowmobile. 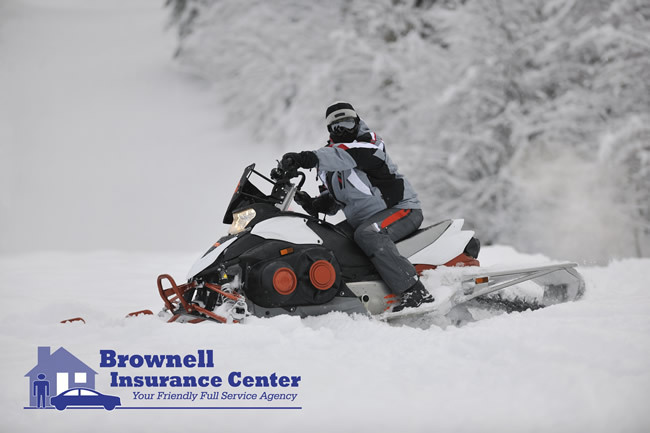 Most snowmobile insurance companies offer the following types of coverages: bodily injury; property damage; collision; comprehensive; medical payments; uninsured and underinsured. We are pleased to help you begin your FREE quote. For questions regarding NH laws and regulations, insurance coverage requirements for recreational vehicles, or to better understand your current policy please call Londonderry 603-437-1992 or Hampton 603.296.0077 for immediate service.